I'll be doing a workshop at the meeting of the Association for Psychological Science in Chicago, Thursday May 24. Details can be found here. 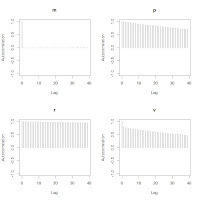 I've made three important changes in the programs for hierarchical Bayesian ANOVA. The neat thing about this prior is that it smoothly drops down to zero as the parameter value gets close to zero. 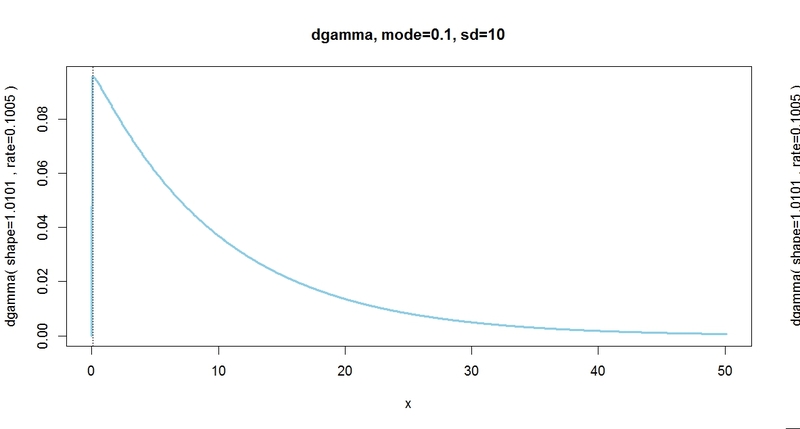 (For how to specify a gamma prior with a desired mode and standard deviation, see this previous blog post.) The prior on the within-cell SD remains uniform, as in the original programs and recommended by Gelman (2006). 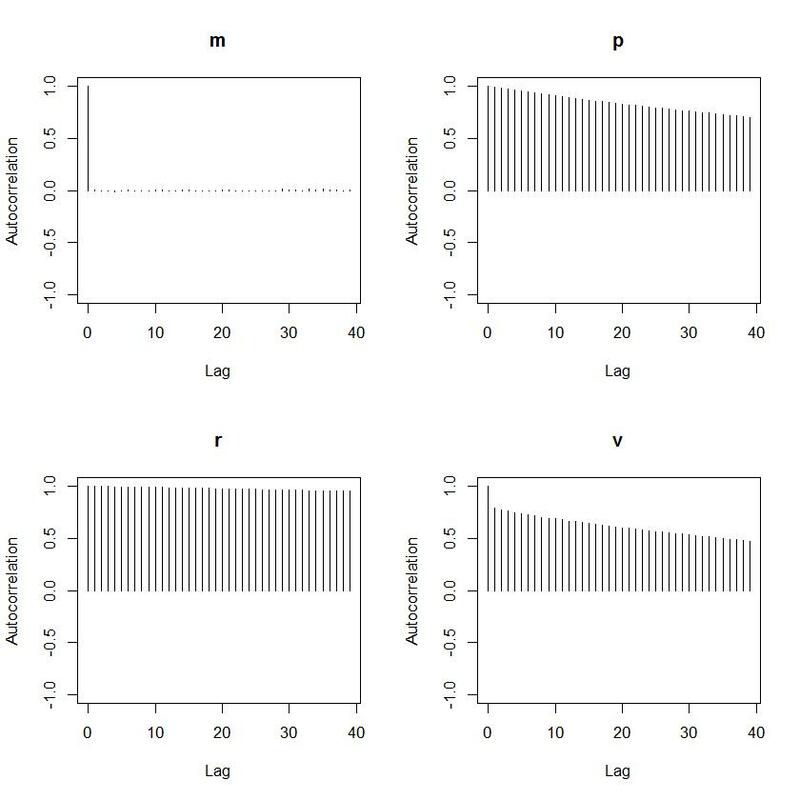 Second, I changed the plots of the variance parameters so that they are on the original data scale, not the standardized scale. This was achieved merely by multiplying by ySDorig. Fourth, I improved the program for displaying posterior histograms, so that it now defaults to better breaks based on the HDI. Therefore it is best to use plotPost without a breaks argument unless the (new) default looks bad. We've obtained a dataset that reports hospital rates of hospital-acquired bed sores (as % of patients, based on hospital-wide patient exams 4 days per year), and they also provide CI's for these point estimates "based on Bayesian statistics" (that's all we know, we're not given any more info)….and I'm confused because many of the hospitals that had a rate of zero events are paired with a confidence interval that doesn't contain zero (confidence interval is higher than zero). What do you think about that? If they really are using Bayesian "confidence intervals", and a frequency of zero does not produce a CI that includes zero, then I bet they are using equal-tailed credible intervals. 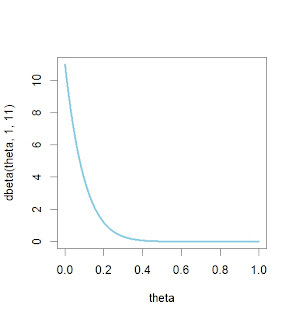 By definition, a 95% equal tailed credible interval has to exclude 2.5% from each tail of the distribution. So, even if the mode of the posterior is at zero, if you exclude 2.5%, then you have to exclude zero. That's why I use highest density intervals (HDIs), not equal-tail CIs. HDIs always include the mode(s). The 95% HDI goes from zero to 0.2384. 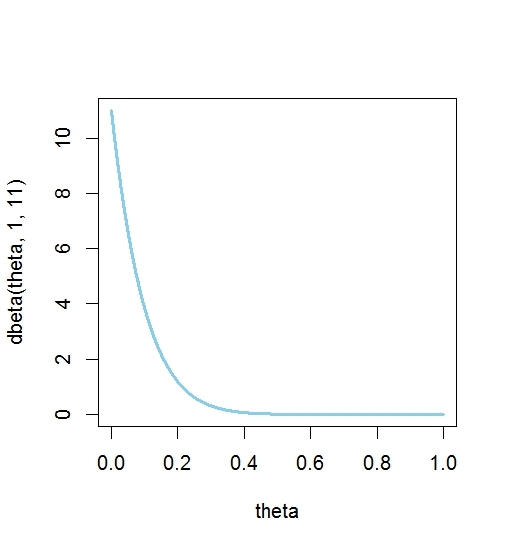 But the 95% equal-tailed interval goes from 0.0023 to 0.2849, which excludes zero. Clearly the HDI seems to be a more intuitive and meaningful summary of the posterior. 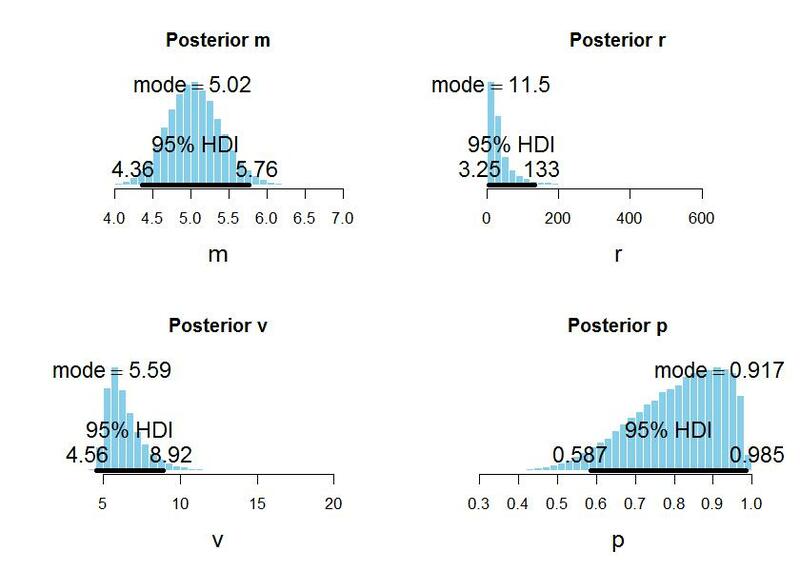 There is a way that the posterior 95% HDI could exclude zero even when the data have a frequency of zero. It can happen if the prior already excludes zero. For example, the prior might be dbeta(1.01,1.01), or dbeta(2,10), or whatever. And, of course, the analogous argument applies when the likelihood is Poisson and the prior is gamma, or what have you. See also this related post. 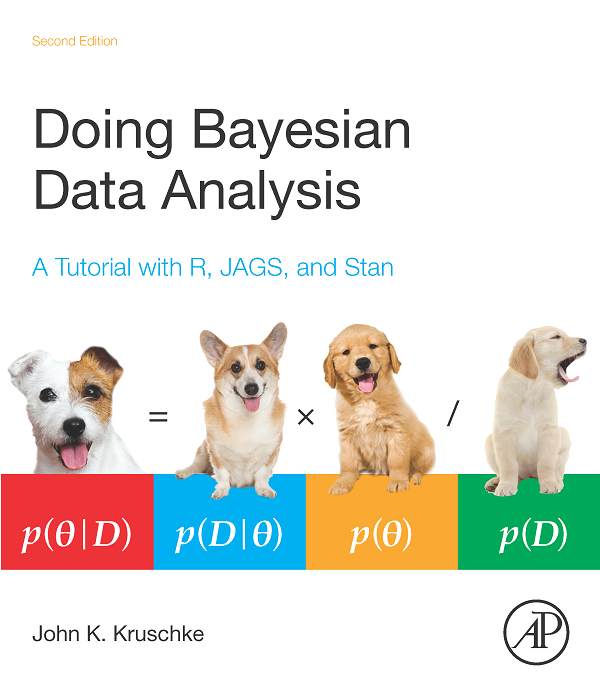 Jeremy Anglim has posted a very nice summary of resources for JAGS and examples of Bayesian analyses. Do give it a look! 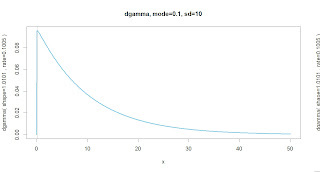 In a previous post, I showed that direct estimation of the p and r parameters in a negative binomial distribution could involve bad autocorrelation in the MCMC chains, and I suggested that there must be some standard reparameterization to solve the problem, and asked for a pointer. Dr. John Davey of the University of Edinburgh was good enough to point the way. 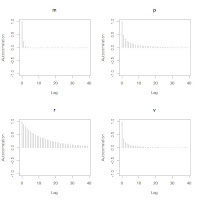 The solution is indeed straight forward: In the direct estimation, the p and r parameters are given priors, while the mean m (and variance v) is derived from p and r. In the reparameterization, the m and r parameters are given priors, while the p (and variance v) is derived from m and r. Autocorrelation in the chains is greatly reduced. Here is an example. The posteriors are a bit different for the two parameterizations, because I used "generic" priors without any attempt to transform them to be equivalent. Thanks to John Davey for this pointer! Some videos about the history of Bayes' rule. Update: Be sure to read the comment from Sharon McGrayne (click the comments link at the end of the post). Update: Be sure to expand the comments link, below, to see Sharon McGrayne's clarifications of Bryson's statements. I'll be doing a workshop at the meeting of the Midwestern Psychological Association in Chicago, Friday May 4. Details can be found here.